Chris Christie: cancels press appearances after vaccine controversy and reports of gifts from King Abdullah. New Jersey Gov. 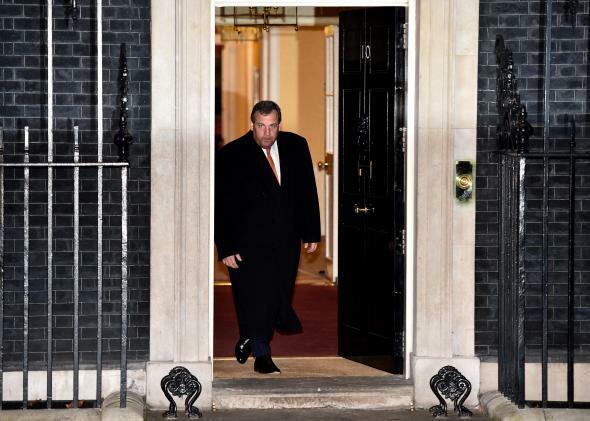 Chris Christie had a long few days in London. New Jersey Gov. Chris Christie spent the last day of his trip to the U.K. walled off from reporters, cancelling two scheduled press events and a speech outside 10 Downing Street, as his “trade mission” was hit with a second wave of bad news from home. With Christie’s office still quelling the controversy he’d touched off by suggesting that the public health need for vaccines should be “balanced” with parents’ choice to keep children unvaccinated, the New York Times published a story about an opulent vacation, taken by the governor and a sizeable entourage, courtesy of two rich and powerful men. “We just decided we’re not going to have availabilities today,” Christie’s spokesperson told traveling New Jersey media, according to Politico. The Times story described a 2012 trip, in which Gov. Christie and his wife, parents, in-laws, three of his four children, four staffers, his former law partner, and a New Jersey state trooper all flew to the Middle East in a private jet on loan from Republican megadonor Sheldon Adelson. After stopping in Israel, they spent a few days in Jordan, taking up a block of rooms at a high-end hotel, party-hopping with Bono, and drinking champagne in the desert. When the $30,000 bill came at the end of what was surely a memorable weekend, the taxpayers of New Jersey were not stuck with the check. It was paid for by Jordan’s leader, King Abdullah. Comella also acknowledged that the use of Adelson’s private plane came as an online gaming bill opposed by the casino-owning Adelson was pending in New Jersey. Comella maintained that Adelson hadn’t “personally lobbied” Gov. Christie about the bill. The Times reports that members of Christie’s staff, presumably not the same staffers who were selected to come on the trip, had concerns about accepting such an extravagant gift from King Abdullah, but they might have relaxed when a couple of years went by and nothing came out in the press. Until this week, when a visit to the U.K. that was clearly intended to shore up Christie’s foreign relations credentials became an exercise in damage control.